THE HESLOP HOUSE: SIBLING BABYSITTING! WELL, I'M SO MAD THESE PICS ARE BLURRY, BUT I CAN'T FIGURE OUT WHAT'S WRONG WITH MY CAMERA! I THOUGHT THEY WERE FUNNY, SO I POSTED THEM ANYWHOO. WELL, STORY GOES I HAD TO GET DINNER GOING, SO I ASKED CONNER AND TAYLOR TO PLAY WITH PRESLEY, USUALLY THIS LASTS A FEW SECONDS, BUT TO MY SURPRISE ABOUT TEN MINUTES WENT BY AND THEY WERE ALL STILL HAVING A GOOD TIME, SO I LEFT THEM ALONE. WELL, THE GIGGLING BECAME A LITTLE OUT OF CONTROL, AND WHEN I WENT TO SEE WHAT WAS GOING ON, THIS IS WHAT I FOUND! 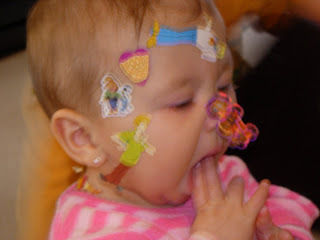 CONNER AND TAYLOR WERE LAUGHING HYSTERICALLY, AND PRESLEY WAS COVERED IN SCOOBYDOO STICKERS! 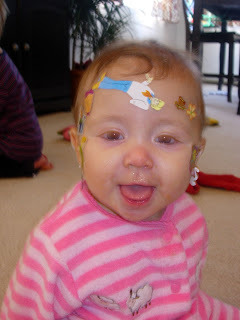 SHE HAD THEM ALL OVER HER HEAD,FACE AND BACK. THEY USED ABOUT FOUR SHEETS OF STICKERS! THE KIDS WERE LAUGHING SO HARD BECAUSE PRESLEY WAS TRYING TO EAT THE ONE HANGING FROM HER NOSE! THE CLEANUP WAS NOT SO PLEASANT THOUGH, OUCH! MAINLY THE ONES THEY PUT IN HER HAIR, I HAVE TO ADMIT THOUGH IT WAS KIDA FUNNY TO SEE PRESLEY YELL AT THEM WHEN THEY WOULD PULL THEM OFF. SHE DIDN'T EVER CRY, BUT SHE DID SHOW THEM SHE DIDN'T APPRECIATE IT. OH, FUNNY TIMES. Jenica, that is the funniest thing. I'm so glad you posted it. That sounds like something my kids would do when they "babysat" for me. That's too funny! OMGosh! I love that! What a tolerant little cutie pie! fun times! Jenica, your kids are so dang cute! I'm so glad I found your blog on Tiffani's blog. I use this way more than myspace! It looks like you guys are doing well. I am excited to stay in touch!